Karate-do is the art of empty hand self-defense. Karate-do (Empty hand-way), or the way of the empty hand. While it's literal meaning, Chinese Hand, dates back to it's Chinese origins, Master Gichin Funakoshi changed the characters so that they would more directly reflect the Zen Buddhist philosophy of rendering one's mind free or empty of emotion and ill feeling so that he or she will react swiftly and decisively in the face of adversity. 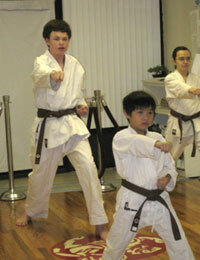 © Mushin Dojo 2009. All Rights Reserved.